The passage of such shocking legislation with barely a whimper from political activist groups goes to show how well the corporate media has performed in camouflaging the legislation with flowery characterizations of helpful volunteerism, when in reality the bill creates the pretext for mandatory national service and the creation of a multi-million man domestic civil defense unit who will be tasked with spying on their fellow Americans under the justification of protecting the country from terrorism. The Senate last night rubber stamped a nightmare domestic draft bill that legislates mandatory national service and creates an “army” of at least 7 million civilian enforcers working at the the behest of the government, while also containing language that threatens to ban free speech and the right to protest. Last week, we reported on the House passage of the Generations Invigorating Volunteerism and Education Act, known as the GIVE Act, which was carried with a 321-105 margin vote. A passage contained in section 6104 of the original House version entitled “Duties,” in subsection B6, states that a commission will be set up to investigate, “Whether a workable, fair, and reasonable mandatory service requirement for all able young people could be developed.” This language has been dropped from the version passed by the Senate. However, Section 120 of the bill discusses the “Youth Engagement Zone Program” and states that “service learning” will be “a mandatory part of the curriculum in all of the secondary schools served by the local educational agency.” This part remains in the version passed by the Senate. Roles which will be staffed by members of the programs, labeled “Required National Service Corps,” include “criminal justice,” “environmental stewardship,” and “public safety”. The bill was rubber stamped by the Senate last night in a 74 to 14 motion, in what is described as a “procedural vote,” a move that creates “An army dispersed to help with education, health services and the environment, (which) would vastly enlarge the notion of “community organizing,” and allow, as Senator Barbara Mikulski, Democrat of Maryland, said tonight, for about 7 million people to be engaged in such work,” reports the New York Times. The Senate will meet tomorrow morning to formally ratify the bill and finalize amendments. Call your Senator and demand that at least the mandatory language contained in this bill be removed. References to the program as the creation of a civilian “army” have dominated mainstream news coverage of the legislation. 7 million members of this civilian “army” equates to about one member for every 50 Americans, a similar figure to the number of East Germans who collaborated with the Stasi and informed on their own citizens during the cold war. The GIVE Act is just one of many pieces of legislation that vastly expand service organizations in line with Obama’s agenda to create a “national civilian security force”. In January we also reported on the introduction by the Department of Defense of a “civilian expeditionary workforce” that will see American civilians trained and equipped to deploy overseas in support of worldwide military missions. Though the civilian expeditionary workforce program is restricted to DoD employees, similar programs have already been established for public sector workers. One such program has seen hundreds of police, firefighters, paramedics and utility workers recently trained and dispatched as “Terrorism Liaison Officers” in Colorado, Arizona and California to watch for “suspicious activity” which is later fed into a secret government database. Similar initiatives have been introduced in other western countries, including recently in the UK with the announcement that MI5 is currently training up to 60,000 UK citizens as part a civilian network of terrorist spotters, according to Prime Minister Gordon Brown and home secretary, Jacqui Smith. In addition, Obama’s Chief of Staff, Rahm Emanuel, publicly stated his intention to help create “universal civil defense training” in 2006. In an interview with Ben Smith of the New York Daily News, Emanuel outlined the agenda for military-style training, essentially a domestic draft, aimed at preparing Americans for a chemical or biological terrorist attack. Asked if the training would be military style, with people wearing uniforms, Emanuel stated, “If you’re worried about are you going to have to do 50 jumping jacks the answer is yes,” adding that the service could be done through state national guard. Shockingly, the GIVE legislation also contains language that could completely demolish the 1st amendment. Numerous other national service bills have been introduced which target everyone from schoolchildren to the elderly. They include the Service For All Ages Initiative, the Summer of Service Act, the Semester of Service Act, the Encore Service Act and the ACTION Act. Regarding the GIVE Act, “The bill’s opponents — and there are only a few in Congress — say it could cram ideology down the throats of young “volunteers,” many of whom could be forced into service since the bill creates a “Congressional Commission on Civic Service,” reports Fox. Indigenous leaders delivered a lawsuit in Quito last Tuesday before Ecuador's Constitutional Court asking that the country's new mining law be declared unconstitutional. The case is the next step that the Confederation of Indigenous Nationalities of Ecuador (CONAIE) is taking to try to put the brakes on large scale metal mining which has achieved unwavering support from President Rafael Correa's administration. Ecuador has been an oil producer for more than forty years. Now that oil reserves are running low, the Correa administration views metal mining as a future source of state revenues. However, even before any large scale project has reached production, indigenous and non-indigenous communities alike are divided over whether it will result in net benefits or net destruction. CONAIE's lawsuit alleges that the mining law is unconstitutional for having failed to consult with indigenous organizations whose territories will be affected by the activity. It also criticizes as “absurd” a final disposition in the law that defines it as superior to others. “The constitution clearly states that organic laws (the highest category of laws in Ecuador before international conventions and the political constitution) can only include those that regulate personal rights or norms pertaining to state institutions,” explained Lawyer Wilton Guaranda from the Regional Human Rights Advisory Foundation in Quito, and one of the signatories on the case. With this legal status, Guaranda believes that the mining law becomes a “barrier” limiting judicial decisions and the development of new laws, such as those to regulate water and nature. Awak's biggest concern is water, a right achieved in the 2008 political constitution that Ecuadorians overwhelmingly approved in September and that government representatives affirmed this week during the Fifth World Water Forum in Turkey. “Mining companies consume millions of liters of water,” said Awak, “which effectively privatizes it.” He envisions that the precious resource could become scarce and speculates that they will end up having to buy back water from the companies. “We will struggle so that our water is not privatized." However, Canadian companies situated in Awak's home province and hoping to develop some of Ecuador's biggest gold and copper deposits have already secured government approval. The same day that CONAIE presented its lawsuit, both Vancouver-based Corriente Resources and Toronto-based Kinross announced that they have received notice fromthe Ministry of Mines and Petroleum to resume exploration work following a suspension on all large scale mining. But what is most clear is the importance of Canadian investment to Correa. All large scale mining was suspended last April when the National Constituent Assembly passed a mining decree that ordered the Ministry of Mines and Petroleum to revoke most mineral concessions for reasons such as failure to consult with communities, or for overlap with protected natural areas and sources of water. It also gave the government 180 days to rewrite the mining law. At the time, Correa met with Canadian investors and explained that the decree was necessary “to put the sector in order,” which had been open to speculation and weak regulation since legal reforms were implemented following a World Bank sponsored study in the 1990s. But in addition to the controversy that the new law has generated, application of the mining mandate has also been limited. Most notably, Copper Mesa Mining (formerly Ascendant Copper Corporation) in the northwestern Intag valley lost two of its main concessions for failure to consult with local communities. In contrast, companies such as IAMGOLD, Corriente, Kinross, and International Minerals maintain key holdings in the south despite heated conflicts over similar complaints. In the case of Corriente Resources, its suspension dates back to late 2006 when violent repression of local protests was carried out by state security forces making use of company installations. With such issues yet to be fully investigated and Corriente now on the verge of selling its project to an industry senior, Correa continues courting Canadian business leaders. “In the mining sector,” he added, “they are the best investments, they respect the environment and our laws the best.”4 This simplistic claim is backed up with images of Ecuador's small scale and artisanal miningsector which is short on investment and environmental controls, and long on devastating impacts to rivers and local communities. But groups protesting large scale metal mining have heard these promises before. The privately-owned Heavy Crude Pipeline (OCP) was built in 2003 after years of multi-sector opposition. As another major contract that benefitted Canadian investors, the OCP faced its first major accident on February 25. The company says a tremor caused the spill which dumped approximately 14,000 barrels of oil into the Santa Rosa river in Orellana Province. For lawyer Wilton Guaranda “the accident is clear evidence that the geographic and natural conditions of Ecuadorian territory are not compatible with such a highly contaminating and toxic activity.” He added that the CONAIE is considering a lawsuit against the OCP consortium. But for communities living in constant conflict over mining whose benefits and protections are stacked on the side of big business, leaders like Angel Awak are trying to avoid unnecessary risk. Explaining that this is what “Sumak Kawsay” or right living means for the future of the Shuar nation, he said the government should be behind them. “We are not saying anything beyond the law. Rather we are demanding that our rights be respected within the framework of the constitution,” he said, noting that Sumak Kawsay is a central principle of Ecuador's new Carta Magna. However, given Correa's current stance and his likely success in upcoming national elections at the end of April, social-environmental conflicts over mining are anticipated to grow with groups promising to halt projects at the local level. A response from the Constitutional Court to the CONAIE's lawsuit is anticipated within six to twelve months. How some military rabbis are trying to radicalize Israeli soldiers. March 25, 2009 "Slate" -- Recent reports of atrocities committed by Israeli soldiers in the course of the intervention in Gaza have described the incitement of conscripts and reservists by military rabbis who characterized the battle as a holy war for the expulsion of non-Jews from Jewish land. The secular Israeli academic Dany Zamir, who first brought the testimony of shocked Israeli soldiers to light, has been quoted as if the influence of such extremist clerical teachings was something new. This is not the case. I remember being in Israel in 1986 when the chief army "chaplain" in the occupied territories, Rabbi Shmuel Derlich, issued his troops a 1,000-word pastoral letter enjoining them to apply the biblical commandment to exterminate the Amalekites as "the enemies of Israel." Nobody has recently encountered any Amalekites, so the chief educational officer of the Israeli Defense Forces asked Rabbi Derlich whether he would care to define his terms and say whom he meant. Rather evasively—if rather alarmingly—the man of God replied, "Germans." There are no Germans in Judaea and Samaria or, indeed, in the Old Testament, so the rabbi's exhortation to slay all Germans as well as quite probably all Palestinians was referred to the Judge Advocate General's Office. Forty military rabbis publicly came to Derlich's support, and the rather spineless conclusion of the JAG was that he had committed no legal offense but should perhaps refrain in the future from making political statements on the army's behalf. Moses, Eleazer the priest, and all the chieftains of the community came out to meet them outside the camp. Moses became angry with the commanders of the army, the officers of thousands and the officers of hundreds, who had come back from the military campaign. Moses said to them, "You have spared every female! Yet they are the very ones who, at the bidding of Balaam, induced the Israelites to trespass against the Lord in the matter of Peor, so that the Lord's community was struck by the plague. Now, therefore, slay every male among the children, and slay also every young woman who has known a man carnally; but spare every young woman who has not had carnal relations with a man." Moses and Eleazar the priest go on to issue some complex instructions about the ritual cleansings that must be practiced after this exhausting massacre has been completed. Possibly you remember Dr. Baruch Goldstein, the man who in February 1994 unslung his weapon and killed more than two dozen worshippers at the mosque in Hebron. He had been a physician in the Israeli army and had first attracted attention by saying that he would refuse to treat non-Jews on the Sabbath. Now read Ethan Bronner's report in the March 22 New York Times about the preachments of the Israeli army's latest chief rabbi, a West Bank settler named Avichai Rontzski who also holds the rank of brigadier general. He has "said that the main reason for a Jewish doctor to treat a non-Jew on the Sabbath … is to avoid exposing Diaspora Jews to hatred." Those of us who follow these things recognize that statement as one of the leading indicators of a truly determined racist and fundamentalist. Yet it comes not this time in the garb of a homicidal lone-wolf nut bag but in the full uniform and accoutrement of a general and a high priest: Moses and Eleazar combined. The latest news, according to Bronner, is that the Israeli Defense Ministry has felt compelled to reprimand Rontzski for "a rabbinal edict against showing the enemy mercy" that was distributed in booklet form to men and women in uniform (see Numbers 31:13-18, above). Peering over the horrible pile of Palestinian civilian casualties that has immediately resulted, it's fairly easy to see where this is going in the medium-to-longer term. The zealot settlers and their clerical accomplices are establishing an army within the army so that one day, if it is ever decided to disband or evacuate the colonial settlements, there will be enough officers and soldiers, stiffened by enough rabbis and enough extremist sermons, to refuse to obey the order. Torah verses will also be found that make it permissible to murder secular Jews as well as Arabs. The dress rehearsals for this have already taken place, with the religious excuses given for Baruch Goldstein's rampage and the Talmudic evasions concerning the assassination of Yitzhak Rabin. Once considered highly extreme, such biblical exegeses are moving ever closer to the mainstream. It's high time the United States cut off any financial support for Israel that can be used even indirectly for settler activity, not just because such colonization constitutes a theft of another people's land but also because our Constitution absolutely forbids us to spend public money on the establishment of any religion. Christopher Hitchens is a columnist for Vanity Fair and the Roger S. Mertz media fellow at the Hoover Institution in Stanford, Calif.
Human Rights Rapporteur: Gaza "War Crime of Greatest Magnitude"
A United Nations human rights investigator said on Thursday that Israel's offensive against Hamas in densely populated Gaza appeared to constitute a war crime of the "greatest magnitude." 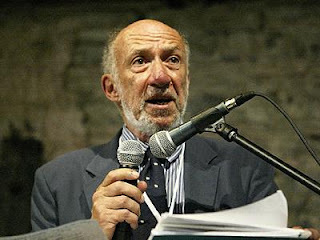 Richard Falk, UN special rapporteur on human rights in the Palestinian territories, said the Geneva Conventions required warring forces to distinguish between military targets and surrounding civilians. "If it is not possible to do so, then launching the attacks is inherently unlawful and would seem to constitute a war crime of the greatest magnitude under international law," Falk said. "On the basis of the preliminary evidence available, there is reason to reach this conclusion," he wrote in an annual report submitted to the United Nations Human Rights Council. Falk called for an independent experts group to be set up to probe possible war crimes committed by both Israeli forces and Hamas. Violations included Israel's alleged "targeting of schools, mosques and ambulances" during the December 27-January 18 offensive and its use of weapons including white phosphorus, as well as Hamas firing of rockets at civilian targets in southern Israel. Falk said that Israel's blockade of the coastal strip of 1.5 million people violated the Geneva Conventions, which he said suggested further war crimes and possibly crimes against humanity. The aggression was not legally justified and may represent a "crime against peace" - a principle established at the Nuremberg trials of Nazi criminals, according to the American law professor who serves as the Human Rights Council's independent investigator. He further suggested that the Security Council might set up an ad hoc criminal tribunal to establish accountability for war crimes in Gaza, noting Israel has not signed the Rome statutes establishing the International Criminal Court. A Palestinian human rights group has released the names of 1,417 Gazans it says were killed in Israel's recent war on the Palestinian territory's Hamas rulers. The Palestinian Center for Human Rights said Thursday that of those killed, 926 were civilians, 236 were combatants and 255 were members of the Palestinian security forces. Most of the policemen were killed in a series of Israeli bombing attacks on Hamas security compounds on December 27, the first day of the war. The group says it has investigated every civilian death. The list is posted on the center's Web site. Israeli government spokesman Mark Regev disputes the findings. He says Israel is working on its own list and contends that most of those killed were combatants or legitimate targets. Thirteen Israelis were killed during the 22-day Gaza operation. Problem It's high noon in July. At 90-plus degrees outside, the masses are jonesing for AC. But it's seriously expensive to keep the juice flowing when demand crests. Firing up turbines that sit idle 360 days a year can multiply electricity costs by a factor of 10. How to keep cool without stressing the grid? Solution Pay big users to cut consumption when the need arises. Many utilities already do an ad-hoc version of this, an emergency practice known as demand response that has lately been promoted by Jon Wellinghoff, acting chair of the Federal Energy Regulatory Commission. Now there's an alternative: Call EnerNOC, a Boston-based company that gangs commercial users who are willing, for a quarterly payment, to trim back operations on 30 minutes' notice. EnerNOC micromanages consumption at 3,400-plus locations from Maine to California. Between dimming lights, adjusting thermostats, and suspending industrial activities, the potential cuts top the output of a large nuclear reactor. And the savings can be huge. EnerNOC's cofounder, Tim Healy, points out that 10 percent of all US generating capacity exists to meet the last 1 percent of demand. Utilities paid EnerNOC $100 million last year simply to stand at the ready—insurance, in effect, against the inevitable days when every AC unit is humming.